Directions: Heat oil in a large skillet over medium heat. Add onion and celery and saute for about 5 minutes. Scraope veggies into the slow-cooker. Add cooked chicken to the slow-cooker. Melt butter in skillet over medium heat just until foamy. Whisk in the flour to make a roux, stirring well to incorporate all the flour. Cook 1 to 2 minutes, or until the roux is slightly golden. Scrape into the slow- cooker. Stir in broth and milk. Add garlic salt and wing sauce. Stir well. Cover and cook on LOW for 6 to 8 hours or on HIGH for 3 to 4 hours. Stir in cheese about 20 minutes before serving. 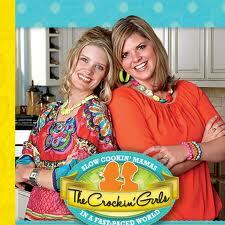 You will LOVE the Crockin’ Girls Cookbook! Available at Adrians Boutique, it features and brilliantly photographs hundreds of great Slow-Cooker recipes! These are two young and very busy mamas who have simplified their lives through Slow Cooker Cooking.